A recent article, A Hidden History of Evil, by Neocon writer Claire Berlinski in the reputable City Journal asserts that — for reasons unknown — the West has deliberately ignored revelations of crimes committed in the Russian Federation since Putin assumed power. Berlinski mentions especially two dissidents currently exiled in England, Pavel Stroilov and Vladimir Bukovsky. Bukovsky is well known for his exposé of the Soviet use of psychiatric hospitals to silence critics of the Communist regime, he himself having been so victimized for years before being exiled to England. Stroilov, on the other hand, belongs to the post-Soviet era and claims to be in possession of documents that put Putin and Gorbachev in a very unflattering, even despicable, light, but cannot elicit any interest in them on the part of Anglo-American government agencies. Both gentlemen are part of a far larger “Putin Must Go” movement with vocal supporters in Russia itself as well as in England and the United States. Other more neutral observers say, however, that the campaign against Putin conducted by the dissidents and a complicit press is unjustified and simply another example of Jewish solidarity in opposing policies that disadvantage their own interests and supporting those that favor them. Dissidence and opposition during the harshest Soviet era of the 1920s, 1930s, and during World War II would have been more than justified, but unfortunately it was rarely heard in the West. To a considerable extent, obscenely wealthy Jewish oligarchs who were squeezed out of the Russian Federation by Vladimir Putin to the great delight of the Russian people finance this multifaceted movement. It did not escape the attention of some observers of US-USSR relations that the principals in the arrangements made between the American (Jeffrey Sachs, Andrei Schleifer, Robert Rubin, Larry Summers) and the Soviet representatives (Yegor Gaidar, Anatoly Chubais) to introduce capitalism in the USSR were all Jewish and that the resultant newly created oligarchs were also Jewish. Gaidar’s other friends included Mikhail Khodorkovsky (whose release from prison is a major neocon project), Platon Lebedev, Grigory Yavlinsky, and Boris Nemtsev. All are Jewish, all are in opposition to Putin, and some are in jail. These unusual, collaborative arrangements, made by co-ethnics in Russia and America with the approval of the official political leadership of those countries, cannot but recall Hitler’s assertion during World War II that the capitalistic Jews of America colluded with their communistic brethren in the Soviet Union to make the war policies of both countries. However, the joy of seeing Communism abandoned in the Soviet Union as a result of those unusual negotiations was so great that most criticism was muted. However, neither exiled nor domestic Jewish dissidents can honestly accuse Prime Minister Putin or President Medvedev of anti-Semitism, especially not those who control the major media. Putin merely insists and will continue to insist that the mass media in Russia not be used for character assassination or to make or subvert government policies. He believes that Russians, not Jewish media moguls with their dual citizen status, should govern Russia. Despite the fact that a good many Russians object to the fact that Jewish entrepreneurs all but monopolize the export of Russia’s mineral resources to countries abroad, the Russian Government continues to permit it. Oleg Deripaska, for example, an associate of Nathaniel Rothschild, is one such oligarch, as is Roman Abramovich, a friend of Boris Berezovsky, is another. They are allowed to do so because they do not attempt to run the Russian Government nor dictate its policies and also because they satisfy the demands of the international globalists. It is interesting to note that Deripaska has since 2003 retained Bob Dole, former Majority Leader and presidential candidate, to lobby the U.S. State Department to grant him a visa. It has only been approved for a single year because the billionaire is suspected of ties to the criminal community. Dole is said to have received about $500,000 for his services. 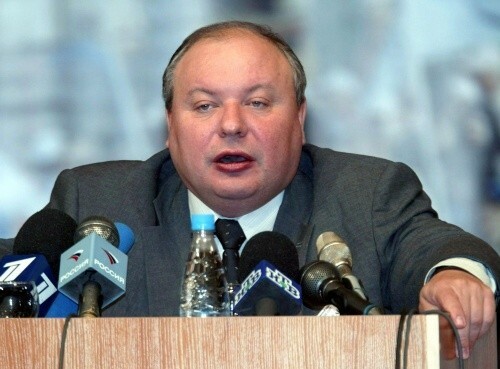 At the same time former FBI chief William Sessions has been lobbying the U.S. Department of Justice on behalf of Semyon Mogilevich, who is on the FBI’s most wanted list for alleged organized-crime links. The exchange of money obviously takes precedence over every other consideration, be it national interest or ethics. So many exiled, anti-Putin Russians have already been granted political asylum in England and have chosen to reside in London that the city is referred to as Londongrad. The British Government obviously does not object to this because the exiles direct billions of dollars to the British economy which otherwise might go elsewhere. Some observers conjecture that the governments of both the United Kingdom and the United States permitted and even encouraged the unorthodox monetary arrangements made with the former Soviet Union, knowing full well that the Jews so involved would inevitably divert the resultant international trade to the dollar or sterling countries.